The DG-90 Security Degausser is able to perform an automatic degauss of high-density magnetic media achieved by applying a highly focused magnetic field through an exclusive multi-axis, 'pole tip' design. 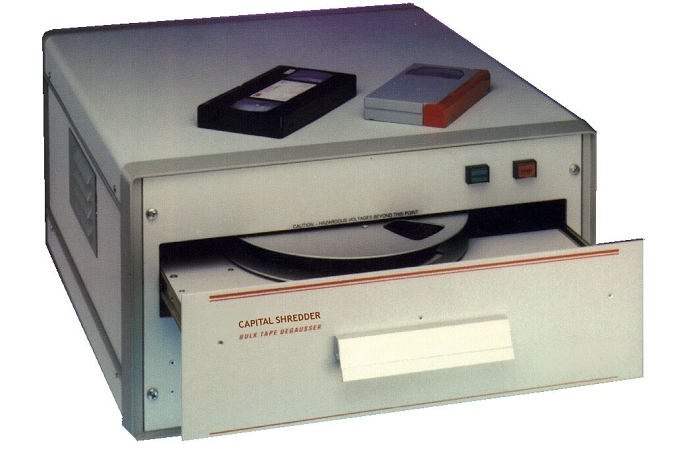 The tapes or cassettes are placed in the drawer compartment and rotated within the powerful 7000 Gauss field ensuring uniform and complete erasure. The DG-90 degausser can cope with a range of media including tapes of up to 16 inches diameter. Up to fifty reels or two hundred cassettes can be efficiently and quietly erased per hour, the DG-90 bulk eraser operates continuously and is quiet, cool and efficient.